I'm no expert by any means when it comes to handmade soaps. I buy them because they smell good, they look fabulous, they make for great gifts, and they are made from natural ingredients. And I also buy handmade soaps because I do enjoy supporting fellow Etsians! And since it is getting close to holiday gift giving time, I thought I would start spreading the word! One of my favorite soap makers is Andrea from Sacred Suds. She is a fellow HandmadeMN team member and an awesome soap maker. On her ETSY profile, Andrea articulates her Sacred Suds mission. It is "to provide soulful soaps that help channel positive energies into your life. The soaps are inspired by goddesses, gods, yoga, the natural elements, and earth-based spiritual paths." How insightful! Andrea's Pumpkin Spice soap is now available - I can't wait for my mine to arrive! Doesn't this photo just ooze cinnamon, clove, nutmeg and everything else that comes with Pumpkin Pie? 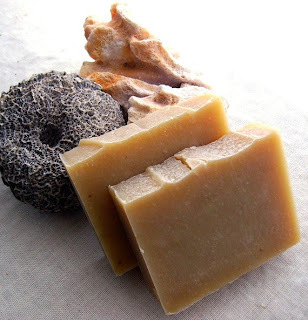 Cory of AquarianBath has a nice selection of handmade soaps including unscsented sea salt soaps for acne skin types and fabulous shampoo bars. Cory is an herbalist, organic gardener, and a soap maker. And I must say, it is so much fun to wash one's hair with a shampoo bar rather than the same old liquid from a plastic container! Here is Cory's Aloe Shampoo Bar with Rosemary, Lavender and Mint. And my latest handmade soap find is from Kim of dirtydivasoaps. 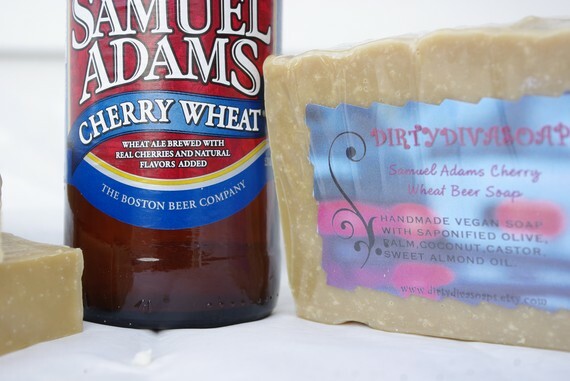 The Dirty Diva Soap Company is a small family business in western Maryland. The soaps are mixed by hand and are made with natural oils and butter. This photo caught my eye and the first paragraph of the product description sealed the deal: "This is for one cold processed bar of Boston Lager Sam Adams Beer Soap Made with 2 bottles of Sam Adams beer , minus a sip or two as the soapmaker was......eh... sampling the product, ahem...just a little." Beer in any form is good!! Have a favorite handmade soap product? -All of the Etsians who make Handmade Soap, it's becoming one of my newest vices!